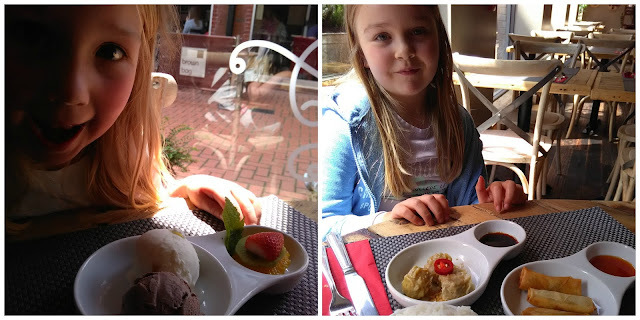 Last weekend we took the girls for a really fun Sunday lunch - something a bit different that they definitely both enjoyed. 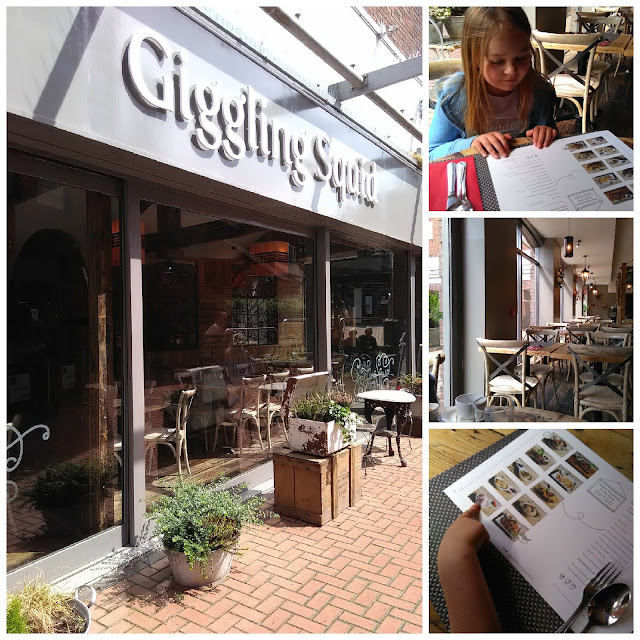 Thai Tapas at Giggling Squid in Wokingham. There are around 20 Giggling Squid restaurants and we are lucky enough to have one in our local town but until recently we hadn't really considered taking the girls there but then last month Giggling Squid launched a new kids menu, Little Tapas for Little People so we went to give it a whirl. The ‘Little Tapas for Little People’ menu, just like the adults tapas menu, offers a choice of flavoursome thai favourites for you to try just a little of each. For just £5.95, kids get to choose two dishes from a selection of Giggling Squid favourites, from milder curries and noodles to rice dishes and nibbles such as dumplings and spring rolls. Lara and Holly both chose pork dumplings with a dipping sauce and spring rolls with chilli sauce but they also joined us in trying chicken satay with peanut sauce, Thai curries and a Massaman curry. The girls got to choose a bowl of rice each to accompany their meal. I'd have liked to have seen a few more vegetables on offer for the kids menu - our own meals were packed with beans, carrots, courgettes and oriental veg but the children's menu didn't seem to feature much (admittedly, our girls chose options that didn't even include a veggie garnish!). For an extra £2 you can choose a pudding - our girls both chose ice cream which came beautifully presented but you can also choose a roti flatbread with sugar and condensed milk. The grown-ups dessert menu features some amazing Thai inspired dessert ideas such as Thai basil and lemongrass sorbet. The girls enjoyed the meal from start to finish. They devoured an entire bowl of Thai prawn crackers while colouring in their menus (there's a chance to win a family meal if you do) and playing the "match the picture" game on their menu. 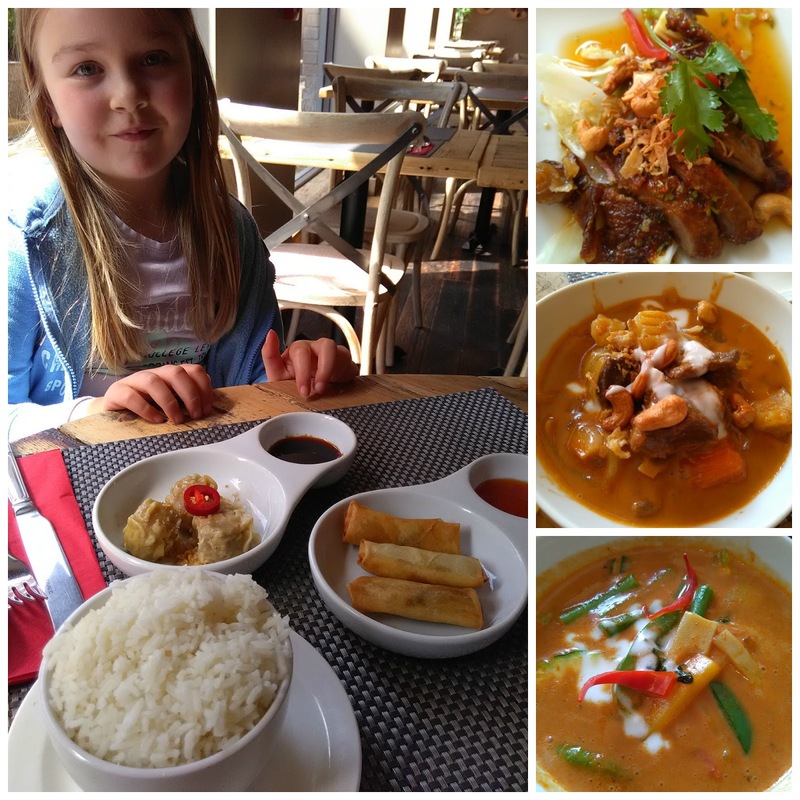 Lara and Holly are both very adventurous when it comes to food, particularly oriental flavours and I think their first experience of a Thai restaurant went down really well. I can definitely see us coming back to Giggling Squid during the day time with them to enjoy lunch more frequently. The atmosphere was really relaxed and we felt we could have ordered any combination of dishes from the menu and enjoyed them all. Disclosure: Our meal was provided for the purposes of this review but we absolutely LOVED it and the girls have already asked for us to go back and we definitely will.